This week the trends were keeping up with the Euro weakness and everything was running smoothly, until Thursday – at the ECB press conference, President Mario Draghi decided to make no big changes except for the for a minor change from -0,2 to -0,3 on the Banks’ deposits interest rates along with the expansion of the asset buying programme as a way to bring inflation up to 2%. Apparently, the market was expecting bigger changes and the major players read this announcement as a stronger European economy and we witnessed a fast rally to the upside with EUR:USD jumping about 400 pips in a couple of hours from 1.05 to 1.09. 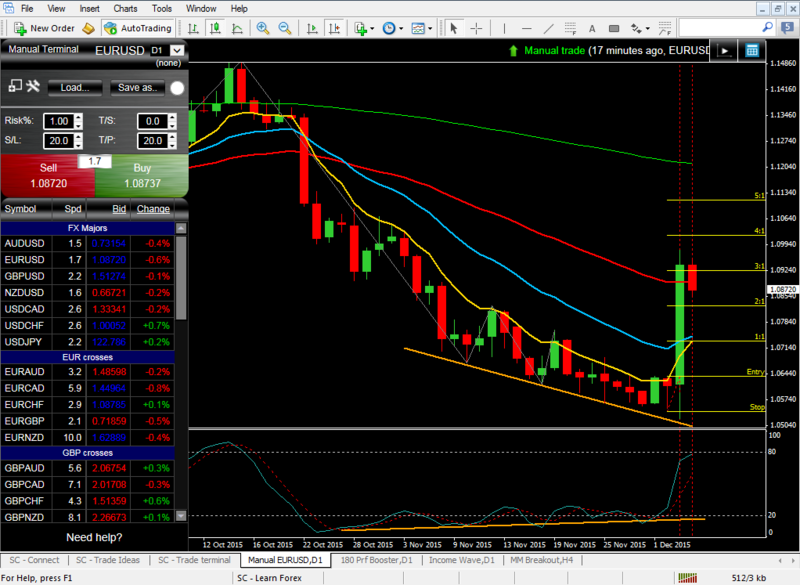 Obviously this was the scenario with all EUR crosses. The Indices were also affected as we witnessed a fall on both the European and the US side – FTSE dropping about 250 points, DAX almost 700, S&P 550, DOW 450. By Friday the European markets started to recover while the US indices made a full comeback getting almost all the lost value from the previous day. On the commodities side, Gold price continued to drop and reached 1046 but at the last day of the week price. As for Crude the price seems to be holding above 40s for now after finally breaking the 43 level two weeks ago. EURUSD (Daily Chart) – Reversal Long – 03.12.2015 – After testing the 1.05 recent support level and showing clear divergence on the stochastic oscillator, the low test bar on the 2nd was a very good excuse to trade this one. In a matter of hours this trade was at +3% in profit and we will now manage it tightly to see how far this move might go. Thursday we will be listening to the Monetary Policy announcements from both the BoE and the Swiss National Bank. And on Friday, we will have the usual Non Farm Employment numbers from the US which are always a matter that clearly influences the global markets. This can become a decisive week as price will now lead us back to the trend from November or reaffirm the ranges after the major pullback last week.